Baby’s severe gastric reflux ends after watching episode of Ricki Lake? When Sylvia Herrera’s infant daughter Alexa kept spitting up her bottle, baby Alexa ended up with a diagnosis of acid reflux (severe colic), and a diet of Zantac, Prevacid, and Prilosec. This article was written by Dr. Zachary Ward, and was originally presented in the summer edition of the 2013 NUCCA News. “When Alexa was born she could never drink more than four ounces of milk at one time,” Sylvia told NUCCA news. Like a lot of babies with digestion problems, the pediatrician prescribed several rounds of medications. But Sylvia found they were doing nothing for the acid reflux. “So we took Alexa to a pediatric gastroenterologist, who specializes in helping babies with acid reflux. He went ahead and had some dye put into her system, and took some x-rays. He said that her stomach flap was stuck open, causing her to regurgitate her food.” The doctor told Sylvia that eventually the problem would go away on its own. But not all cases of acid reflux do go away on their own. Two years later, Alexa still struggled with reflux, and seemed to have developed a serious complication: she refused to chew and swallow her food. “I started trying to feed her baby cereal, and she never took to the texture and she spit it out,” Sylvia said. “She would only gnaw on solids. She was very fearful of swallowing.” The same specialist suggested that Alexa had a sensory disorder that made it uncomfortable to chew and swallow her food. He he did not offer a treatment for her problem. Sylvia described her daughter as small and underweight for her age, now two and half years. Until recently, Alexa received most of her nutrition from night time feedings of PediaSure, since she refused to eat, and continued to have acid reflux. 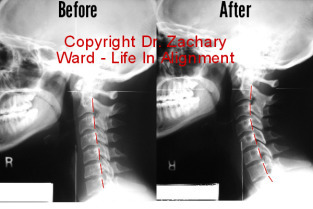 It all began to change when her mother discovered Dr. Giancarlo Licata, an upper cervical chiropractor with the National Upper Cervical Chiropractic Association, during his appearance on the Ricki Lake Show. An appearance that specifically addressed colic and acid reflux in infants. Dr. Licata learned that Alexa had been born by c-section, and suggested in his consultation with Sylvia that the force required during the procedure had probably placed stress on Alexa’s spine, resulting in her problems. “The misalignment was stopping her nerves from communicating properly,” Syvlia said. So, Alexa received her first upper cervical adjustment. Alexa’s changes suggest that both her acid reflux and her sensory issues with food texture changed for the better. “In my opinion,” said Sylvia, “my daughter was misdiagnosed”.